In this week’s chart series, I look one of the industries that has enjoyed considerable growth in Ex-Im assistance: the green energy and sustainability sector. 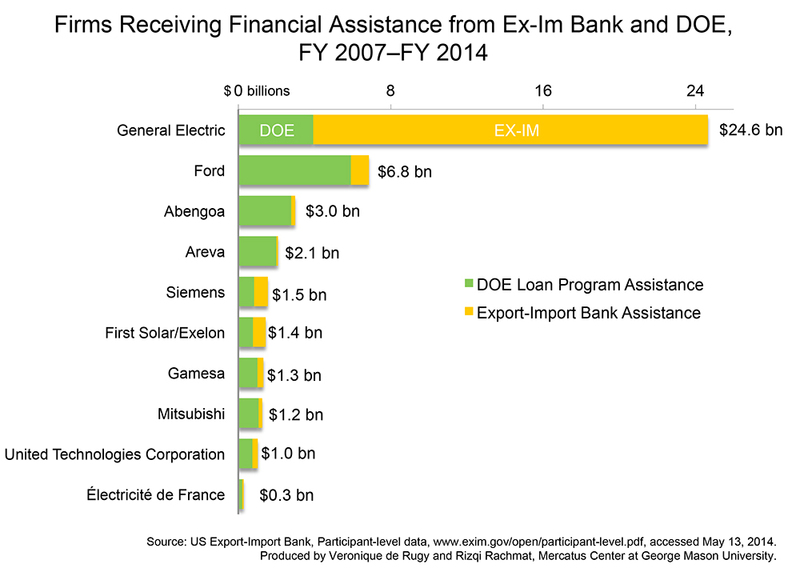 Natural-gas-related projects received the largest amounts in Ex-Im Bank assistance of all green-energy projects, pulling in $11.8 billion in assistance from FY 2007 to FY 2014, or 62 percent of the green portfolio. Solar energy comes in the second spot, with $3.7 billion in assistance, or almost 20 percent of the portfolio. Nuclear projects received roughly $1.8 billion in assistance, while wind projects received $1 billion in assistance. Of course, the double dipping doesn’t stop there: Many of these firms also benefited from the Department of Treasury’s 1603 grant program and from numerous state’s tax credits and mandates. That’s true of U.S. companies like GE (which provide turbines to many government-funded green-energy companies) but also of foreign companies like Abengoa, a Spanish multinational. Speaking of Abengoa, the large amounts of assistance provided to the firm by the U.S government could raise possible conflicts of interest. The company benefited from $2.8 billion in assistance from the DEpartment of Energy, $203.9 million in help from the Export-Import Bank, and significant money from the Department of Treasury for its project in Minnesota and another project in Arizona. As it turns out, former vice president and green-energy advocate Al Gore bought a large stake in Abengoa in 2007. Former New Mexico governor (and Obama administration ally) Bill Richardson is a member of the Abengoa International Advisory Board. Richardson was also a member of the 2013 Advisory Committee that guides Ex-Im policy. And the above aren’t even all of the beneifts Abengoa’s gotten: In 2012, the Department of the Interior fast-tracked approval for Abengoa loans; the firm received generous investment tax credits to open its (Obama-endorsed) Solana project in 2008; the predominately U.S.-funded Inter-American Development Bank, where Richardson sat on its selection committee, awarded Abengoa a $41 million loan for a wind-energy project; and Abengoa received a special $2 million “SunShot” award grant from DOE in 2013. The icing on the cake? Bill Richardson is a former Department of Energy secretary.